Within any financial software system the general ledger, or GL, is the core piece which provides the central pool of accounting data required for financial reporting. While the interfaces will differ cosmetically within various systems and the basic functionality and purpose will be similar, there are large differentiators when comparing simple systems such as Quickbooks or Netsuite to a fully functional ERP solution such as Sage 300 ERP. The GL account functions can be very basic when your company is small and has limited accounts in the chart of accounts, but when growth creates new complexities in operations and you need to manage the data between different departments, the flexibility and functionality of your system needs to grow with you. When you need to step into a solution that pulls data from various departments with their own workflows and systems without trying to maintain and manage a specialized software system for each department and then keying their data back into the core system, the solution is ERP. Below are GL interface diagrams of Quickbooks, Netsuite and Sage 300 ERP which illustrates that the features and flexibility are there as you need them when it comes to consider moving into a more sophisticated business management and financial system. 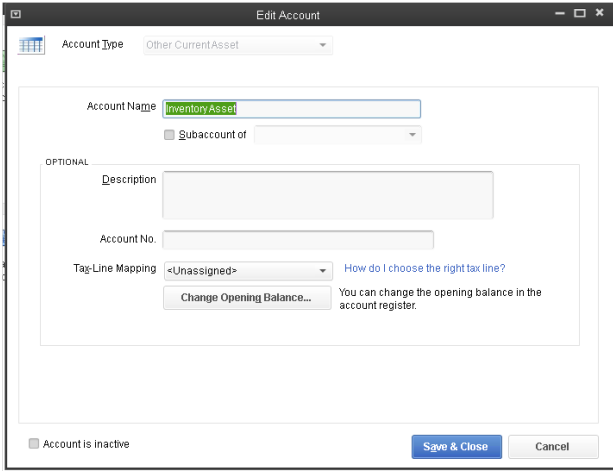 In Quickbooks the GL account is optional. 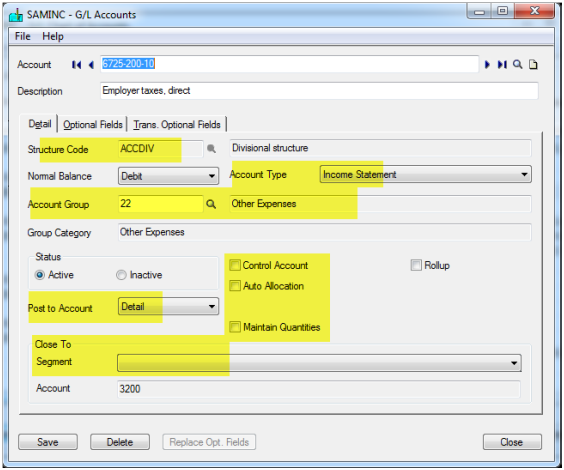 The account dimension or segment has only 2, account and class. The account length is not validated and can vary based on user input. The account number can be changed within the setup screen too at any time but is that really a good feature? In Netsuite the feature set is identical to QuickBooks. In the Sage 300 ERP diagram below, you can see the difference in terms of options available for data management features. In Intacct there are more Account features than Netsuite and QuickBooks. It requires an account number where the other systems make this optional. Notice the ability to close to Retained Earnings and the ability to add 2 segments (Department and Location where QuickBooks and Netsuite only have a 1 segment available called Class). 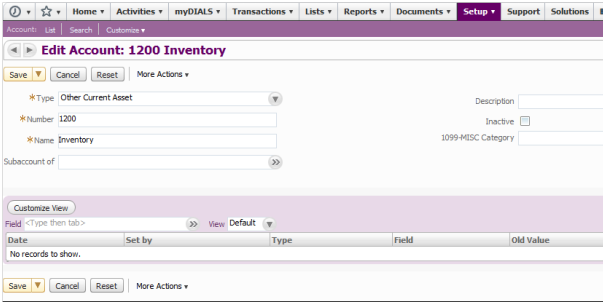 Intacct offers more flexibility to create user defined categories account for reporting. Now compare to Sage 300 ERP which has this functionality and more..
Sage 300 ERP has up to 10 GL segments, a 45 character GL account and unlimited GL structures to validate the length of characters in various types of accounts. 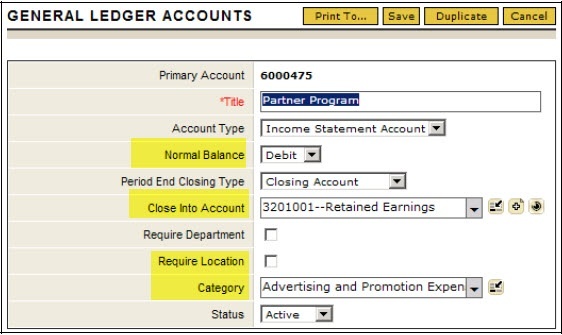 Other features include multi-currency (in more than 1 source currency per account), custom fields, account type to allow closing to retained earnings, ability to close to multiple retained earnings by GL segments, unlimited user defined account groups, control accounts, allocations, roll up accounts, maintain quantities, ability to post balances in detail or consolidated which is helpful if you are trying to prevent detail payroll information to post. Bottom line - This feature comparison does not just exists within the chart of accounts. Imagine how your customers, shipping, inventory management, pricing, vendor costs and other keys areas of your system are not measuring up. If this article resonates, perhaps you need a more robust solution that will continue to scale to your needs as growth continues.